It’s true diamonds are a girl’s best friend, but there’s also a reason why Coco Chanel favored pearls. So, what’s a glamour girl creating her wedding day look to do? After all, when you’ve got a taste for the extraordinary, stopping at one kind of gem is like having only one pair of divine shoes. Why not have your cake and eat it, too, and combine sparkle with pearls for legendary aisle style! To emphasize the dazzle and highlight the pearl, go for a gown encrusted with crystals and a soft, simple up-do to highlight your statement mother-of-pearl and Swarovski flower hair comb. Echo the luminescence of your pearl and CZ chandelier earrings with a makeup palette that simmers. 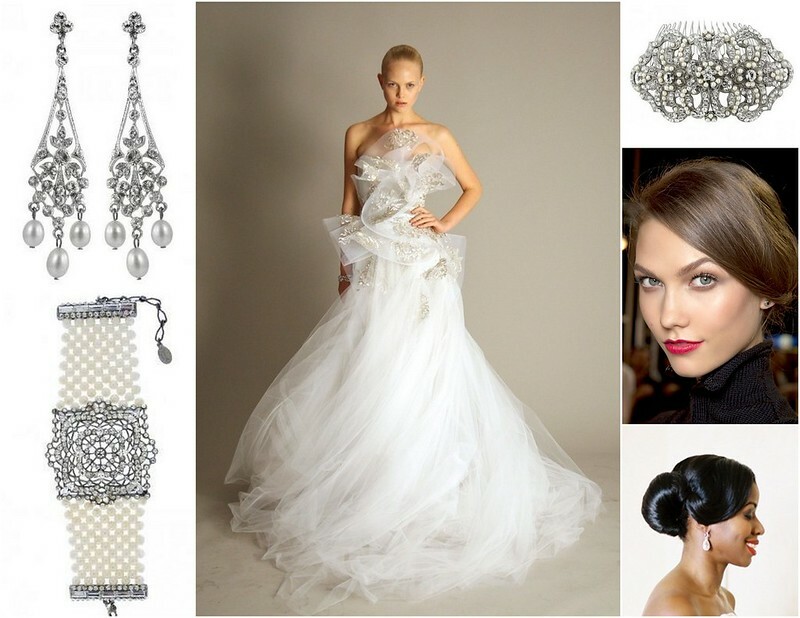 Top everything off with an eye-catching four-strand pearl bracelet adorned with a broach. For a look that’s equal parts glitter and pearl, choose a romantic, textured gown, then pair it with pearl-drop chandelier earrings and a gorgeous six-strand cuff bracelet. Finish everything off with a headpiece covered with pearls and gems that sparkles with each turn of your head! To see our extensive collection of pearl and crystal bridal jewelry and headpieces, visit us in Brooklyn at Bridal Styles Boutique! This entry was posted on Tuesday, June 18th, 2013 at 9:41 am	and is filed under Blog, Inspiration. You can follow any responses to this entry through the RSS 2.0 feed. You can skip to the end and leave a response. Pinging is currently not allowed.